A £25m railway station that is failing to meet predicted passenger numbers was built in the wrong place, a campaign group said. East Midlands Parkway opened in 2009 with 750,000 annual passengers expected but last year handled 328,000. 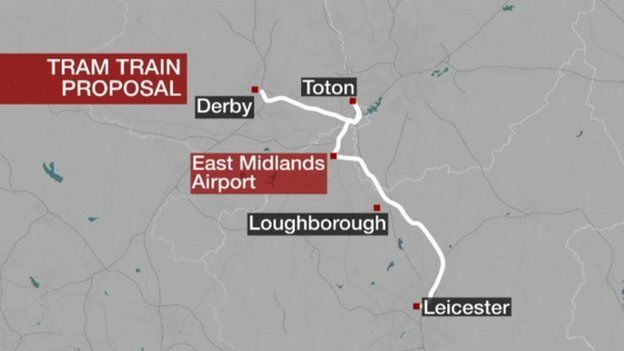 The Light Rail Transit Association said it was too far from East Midlands Airport and called for a tram system. East Midlands Trains said passenger numbers are increasing and the parkway was built to ease pressure on the M1. Figures published by the Office and Rail and Road revealed that in 2013-14, 328,446 passengers went through the parkway. The ORR suggested the increase of 44,690 on the previous year was influenced by the temporary closure of Nottingham railway station. Not-for-profit organisation LRTA said: "East Midlands Parkway station was built to partially serve [the airport], but is too far... to be attractive and the railway station has significantly failed to attract passengers. "The LRTA believes that the airport would be much better served by use of tram-trains." It suggested linking the system, which allows trams to run on rail track, to Derby and Leicester, the HS2 hub and Nottingham's existing network. East Midlands Trains, which runs the parkway, said the station was never intended to serve the airport and the predictions for passenger numbers were made before it took over the franchise. A spokeswoman said: "Since its opening in 2009, this station is attracting a good mix of business and leisure passengers as well as regular commuters and earlier this year we launched the Railink service, offering a convenient shuttle service between the station and East Midlands Airport." A Network Rail spokesman said: "We are aware of an aspiration to develop tram-train in the East Midlands and we would be happy to work with stakeholders should funding become available in the future."